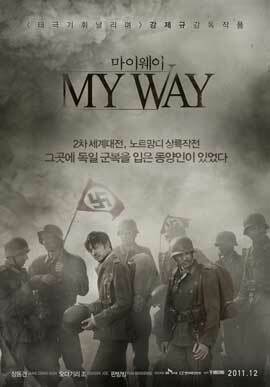 ‘My Way’ starts in Korea during the Japanese occupation in the late 1920’s. 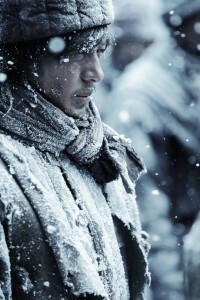 Kim Joon Sik, a young boy who lives with his family at the Japanese officer’s residence all work for the Japanese officer. The officer’s grandson, Tatsuo Hasegawa comes to live with his grandfather and instantly both Joon Sik and Hasegawa form a friendship over racing on foot. We see the two boys grow up and participate in marathon running competitions through their teen years with both of them having lost and won against each other. They still have a friendly rivalry. After Hasegawa wins an important race in High School, his grandfather throws him a party. During the party, Joon Sik’s father is handed a gift to give to Hasegawa’s officer Grandfather. When grandfather opens the gift, a bomb is revealed and grandfather places himself over the bomb thus saving everyone at the party, but sacrificing himself. Confused by anger and grief, Hasegawa blames the Korean people and Joon Sik’s family for the tragedy and exiles him and his dad from the house leaving the rest of their family to fend for themselves. Hasegawa tell’s Joon Sik that if he ever sees him again, he will kill him. We fast forward a few years later and find Joon Sik trying to support himself and family as a rickshaw driver. One of his customers tells him to rush to a press conference for the Olympic Games. His customer turns out to be a previous gold medal Korean marathon runner who is going to the press conference to ask why Korean people have been banned from running in the Olympic qualifying rounds. We see that Hasegawa is at the press conference and will be competing in the race. Hasegawa has changed over the past few years too. He has become hard nosed and unfriendly. Hasegawa states at the press conference that he will indeed win the race with no problems. Joon Sik now at the press conference then asks if that that Japanese are so confident in winning, then the Koreans should be allowed to participate. Without an answer, it is decided to let Koreans participate in the qualifying rounds and that Joon Sik himself will be allowed to run in the race. Huge crowds gather at the qualifying race to support both Hagesawa and Joon Sik. The race starts without problem until the final stretch when one of the Japanese runners tries to trip Joon Sik on purpose. Joon Sik avoids the Japanese runner and ends of winning the race. But not all is well. The judges disqualify Joon Sik for tripping the Japenese runner who tried to trip him and grant Hasegawa the winner. This causes a huge riot with Joon Sik and the Korean crowd of supporters and are all arrested. They are all sentenced to fight in the Japanese Imperial Army. Joon Sik and his Korean friends quickly find out that their lives have become very difficult and abusive. Not only are they fighting in a war for the enemy, but are also being abused and tortured by their Japanese comrades and officers. Despite all of this hatred, Joon Sik still runs and trains for marathon running as it is his passion. After a battle defeat, a new Colonel officer takes charge of the Japanese battalion which turns out to be Hagesawa. Hasegawa is now a cruel and ferocious leader and never gives any of his soldiers mercy. He even sends them to die in impossible situations. On a suicide mission, Joon Sik and his Korean friends are trapped by a great sniper who turns out to be a female. Joon Sik defeats her but doesn’t kill her as her and him have the same enemy. She is taken as a prisoner. Hasegawa orders Joon Sik and his Korean friends on a suicide mission to which Joon Sik refuses. Hasegawa imprisons him and sentences him to death. His Korean friends break him and the female sniper out from imprisonment and all escape. As all of them are about to board a boat back home, Joon Sik sees tons of Soviet tanks headed to the Japanese base for a surprise attack. He tells his friends to take off without him as he wants to warn the rest of his friends left at the Japanese base of the impending attack. On the way back, he is attacked by a fighter plane. This plays out just like Hitchcock’s ‘North by Northwest’ and might be just as good if not better. The female sniper joins Joon Sik and shoots down the plane with her sniper, but not before the plane can get a few rounds in her as she lays to die. 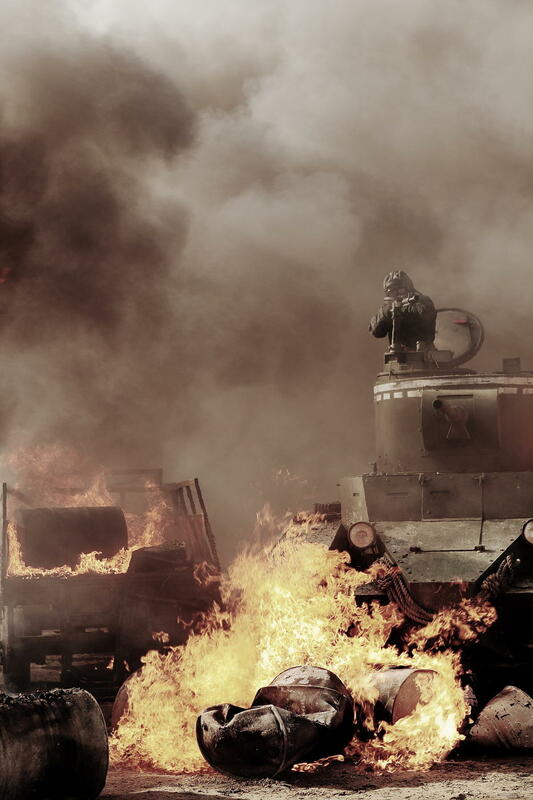 Joon Sik arrives too late to warn his friends and the Japanese base is completely overrun by soviet tanks. As many of the Japanese soldiers start to retreat, Hasegawa starts shooting and killing his own soldiers telling them to fight or die for their Emperor. Hasegawa and Joon Sik are then knocked unconscious by a powerful explosion. Now we see both Hasegawa and Joon Sik taken to the Soviet P.O.W. base which is surrounded by a bitter frozen wilderness. Hasegawa is told by the Soviet commander to swear alliegiance to the Soviet Union and step on his Japanese flag. Hasegawa, still being proud and loyal to Japan, defies the Soviet commander and is punished. We soon then realize that one of the officers in the Soviet army is a fellow Korean friend. Things seem to go well for Joon Sik and his Korean friends for a little bit due to the Korean officer. But all are always on edge due to the Soviets killing and burning people for stepping out of line or for getting frostbite. Tensions are still very high between Hasegawa and Joon Sik and it all comes to a head when the Soviet officers force Hasegawa and Joon Sik to fight to the death. Joon Sik almost kills Hasegawa, but at the last moment has a change of heart and decides not to kill him. Hasegawa begins to admire Joon Sik and his conviction and loyalty as Joon Sik still runs every day. A riot breaks out during work one day, and Joon Sik and Hasegawa are sentenced to immediate death. They are about to be shot, when a surprise attack from the German army opens all hell on the Soviet base. The German Army is too strong and too many for the Soviets and all of the Japanese and Korean people are forced to run and survive. Hasegawa witnesses a Soviet commander shooting his own soldiers for retreating and not fighting. This is an emotional moment for Hasegawa as he finally realizes he has done wrong and sees how lives can be wasted for no reason and that retreat is a good thing at times. After the attack, Hasegawa and Joon Sik find each other alive and Joon Sik tells Hasegawa that he plans to cross the border into Germany and find a way home. Hasegawa journeys with him and they change into German uniforms from dead soldiers. Both of them make their way to Germany with Joon Sik literally carrying Hasegawa on his shoulders due to some viable injuries. 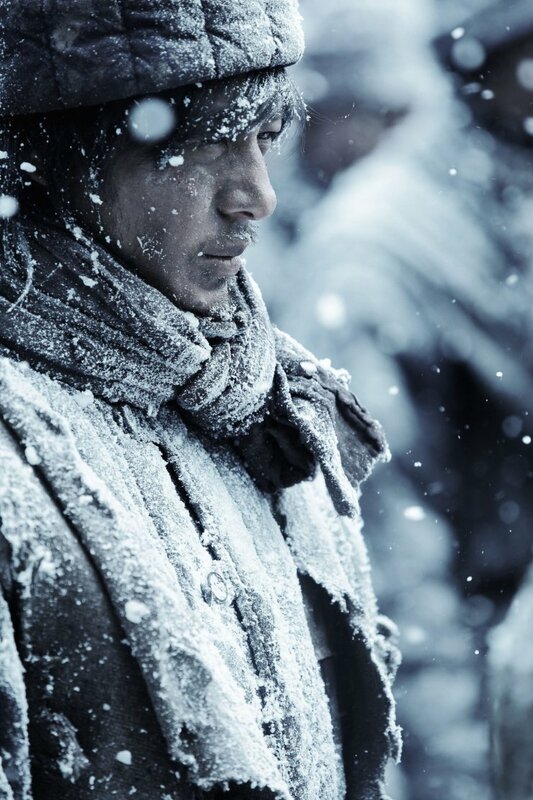 They stop at a war torn and abandoned town so Joon Sik can look for medical supplies for Hasegawa. A German batallion passes through and Joon Sik pleads for medicine from them. But the Germans don’t understand his language and figures he’s a drafted deserter and they take him with them leaving Hasegawa almost near death from his wounds. We hear one of the Germans say to search every corner of the village. A few years go by and we see that Hasegawa is alive and fights for the German army. Hasegawa is in a battalion full of other foreign soldiers and is constantly talking about escaping the German Army and head for home. They all arrive at the famous Normandy Beach and being set up. Everyday for years now, Hasegawa has searched for Joon Sik until he spots a runner on the beach. Well, guess who it is? It’s Joon Sik who also fights for the German Army. This was an incredible moment for both characters and for me as the audience. It brought a tear to my eye as these old friends embraced each other. Hasegawa learns that Joon Sik has gone completely deaf due to a grenade explosion, so now Hasegawa plans both of their escapes from from Normandy. Right as their planned escape is about to start, the USA and Allied Forces begin the attack on Normandy. Will they escape and make it home together? You;ll have to find out and see. This is Korea’s most expensive film to date and it shows on every level. A lot of love and passion went into this project. The film spans several countries, several languages, epic battle scenes, and some of the best special FX I have seen. I really felt like I was transported back in time and to different countries. The war scenes were really mesmerizing and incredible. I’ve never experienced war before, but I feel like I got a small taste at the true face of all the horrors of war. The war scenes impressed me so much, that I couldn’t remember seeing any war scene that good since ‘Saving Private Ryan’. The film is so tense and enthralling, that you actually will begin to feel like our main characters as they are transported as prisoners from country to country. The film rarely lets you breathe, but when it does, it is much deserved. The two main actors, Jo Odagiri and Jang Dong Gun did an utterly flawless job with their roles. Jo plays Hasegawa who goes from an evil and brutal man of war to a friendly and accepting man who now believes in the value of lives and those who are different from him. The results are astonishing and I found myself really pulling for him to make right decisions. And Jang plays Joon Sik who keeps a level head and is always looking out for his fellow man. It’s also his determination and conviction to doing right that makes Jang such an amazing character. And watching these opposite characters form a friendship over the course of cold blooded murder and war was truly an unforgettable experience. I really did not understand why director, Je-kyu Kang decided to put in the female sniper character. She wasn’t on screen that much and is killed pretty quickly. But she is a pivotal character in this tale. I was glad that she was killed though for fear of her and one of the characters forming a romance. I just thought that character was unnecessary. Maybe Je-kyu Kang added her in to have a sniper element in the film. Although this is a brutal epic war film, the connection with the two characters and their trials and tribulations they go through in order to get home will fascinate you and really hit you on that emotional level of reuniting with a long lost best friend. The film itself is huge. It covers a large part of the globe during a very important and historic time. I wish I could buy a ticket for the world to see this film. It’s a milestone in filmmaking and monumental on every level. I interviewed Je-kyu Kang, the director of the film and the video of the interview should be up shortly. Also you can read my condensed version over at Arts+Culture Magazine. This entry was posted on Wednesday, April 25th, 2012 at 11:42 am	and is filed under Film, News. You can follow any responses to this entry through the RSS 2.0 feed. You can skip to the end and leave a response. Pinging is currently not allowed.